You can find anything you want by the user-friendly UI in seconds. The instructions displayed on the interface help users directly convert audio files just by clicking buttons. You can add your audio files easily. Two ways are available for you to add audio files: click “Add Files” to input or drag & drop files to the file list window. Easily navigable, the converter is designed for all levels of users. 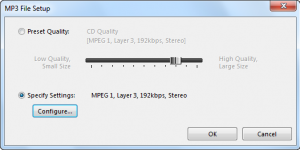 You don’t need expertise in file formats or confusing bitrate settings to use this smart audio converter but will find its advanced features powerful if you are using it. All things could be well done just by clicking. With our easy add-set-convert solution, you can easily convert your audio files into what format you want without reducing quality. Easy interface lets you finish the conversion in three steps. You can precisely adjust the quality through presets, no need for related experience. Output directory can be conveniently specified.